You may be at a standstill because of the “wrong “ that was done to you or you may just be existing. You’re here but not really here. It seems like you walk in a daily fog and continue to think this is a terrible nightmare. Let me help you change that. In the midst of GROWING through my pain, I’ve learned that I’m in control of no one but myself. Yes, things will happen; that’s just life. how we respond is our responsibility. How we move forward is up to us. If we never get an apology, we must keep moving. Let me tell you something. They are not worth you not fulfilling every assignment God has for you. They are not worth your tears. They are not worth you felling “less than”. Honey, YOU are FABULOUS ! Join me for 30 minutes of Jam Packed POWER. Are you still focused on what “they” did to you? Do you struggle with unforgiveness? It’s time you get “unstuck” and move past your pain and into your PURPOSE. Your pain is holding you hostage. You have imprisoned yourself to a life unfulfilled and void of purpose. It’s time to change that. We are almost halfway through 2014. You deserve to LIVE. Not just exist, but LIVE. I am an Author, Motivational Speaker and Sexual Abuse Survivor . I am dedicating 30 minutes of “POWER” to you because I think you’re fabulous and deserve all that God wants you to have. 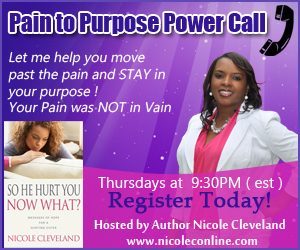 Let me help you move past your pain and into your purpose. This is a FREE call. Glad you asked. Just register ( below ) and call in. See ya on the call !